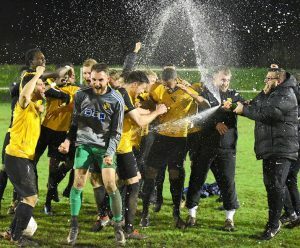 WESTFIELD FC secured the Combined Counties League Premier Division title with a 4-1 win on Thursday (12 April) at home to local rivals Knaphill. Despite the waterlogged conditions at Woking Park, the Yellows comfortably finished off what they started in August last year, and with six games spare. Two goals from Max Blackmore, one from Aaron Watson and an unfortunate own goal from Robbie Kersley gave Tony Reid’s side the points they needed to clinch the title for the first time in their history. Danny Taylor scored the visitors’ only goal. Westfield now have 100 points and have scored 135 league goals,with a goal difference of +101 prior to Saturday’s fixture away to basement club Epsom & Ewell. The club will be presented with its league trophy at Woking Park after the match against Bedfont Sports on 21 April. More celebration pictures on Twitter @Woking_NewsMail. All pictures © Woking News & Mail.